Squadron Prints First Edition 1997. 103 pages including photographs. Fine condition cardcover book. Clean, tight and bright. 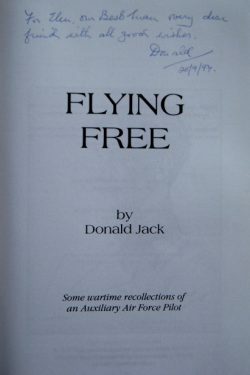 Donald Jack was a pre-war pilot with 602 (City of Glasgow) Squadron and his Battle of Britain memoir adds to those of Sandy Johnstone, Hector Maclean and Paddy Barthropp. 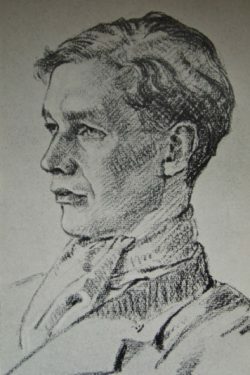 He also had the distinction of being drawn by Cuthbert Orde in October 1940. His book describes the personal experiences of a ‘very ordinary’ fighter pilot who was lucky enough to survive to tell the tale after more than three years of operational flying in Spitfires and Hurricanes in Britain and the Western Desert. After leaving 602 Squadron, he commanded 123 Squadron in Britain and then took command of 80 Squadron in Palestine. 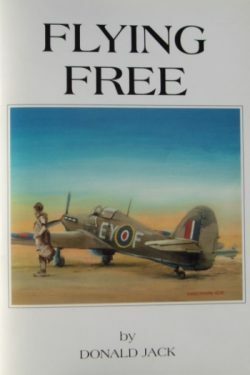 A rare signed Battle of Britain book and currently there is not another copy, even unsigned, for sale anywhere on-line.